On the Feast of the Assumption, 1942, the SS Ohio limped into Valletta’s Grand Harbour, carrying the fuel needed to save Malta from surrendering to the Nazis. The full story of Operation Pedestal is below, courtesy of Charles Debono and published in thebTimes of Malta here. Salve Regina / Sliema Ghalik, Sultana! As Malta edged inevitably towards starvation and surrender in the summer of 1942, a major naval undertaking was being put in train to enable Malta to survive. The suspension of Arctic convoys until the shortening days of autumn released a number of warships from the British Home Fleet for service in support of Operation Pedestal. On June 18, 1942, British Prime Minister Winston Churchill was in Washington, where the chiefs-of-staff cabled him, urging him to request the loan of the tanker SS Ohio, on the same basis as SS Kentucky. Also requested from the American administration were two other merchant ships, Santa Elisa and Almeria Lykes. The remaining merchant ships were British and all of them were armed with anti-aircraft guns. 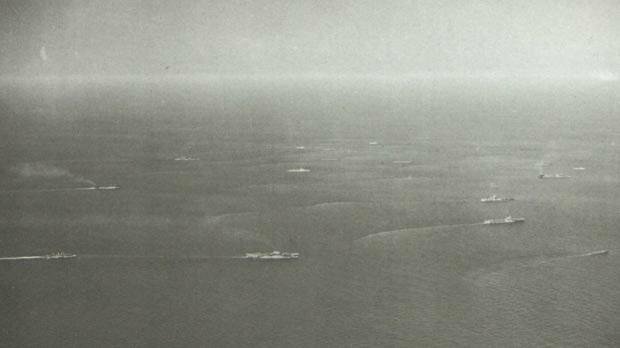 A large escorting force was assembled to protect the convoy, comprising two main groups of ships, Forces Z and X. The overall operational commander was Vice-Admiral E.N. Syfret. The convoy was codenamed WS.5.21.S. Just prior to sailing, Rear-Admiral Burrough met with the Convoy Commodore A.G. Venables, and the masters of the individual merchant ships on board his flagship. The convoy entered the Mediterranean on the night of August 10, 1942. Its codename became Operation Pedestal. Protecting the vessels, the Royal Navy had the three aircraft carriers HMS Eagle, HMS Victorious and HMS Indomitable, the battleships HMS Nelson and HMS Rodney, besides seven cruisers, 32 destroyers, eight submarines and other units. 1.15 p.m.: The German submarine U-73 fires four torpedoes into HMS Eagle, sinking it in eight minutes. Some 927 survivors out of 1,160 officers and men were picked up from the sea by the tug HMS Jaunty and two destroyers, HMS Lookout and HMS Laforey. 2.50 p.m.: HMS Furious successfully flies off 38 much-needed Spitfires to Malta (Operation Bellows). 4.16 p.m.: The Italian submarine Axum fires four torpedoes and hits three ships, two of which are HMS Nigeria and the anti-aircraft cruiser HMS Cairo, severely damaging the latter. Cairo had to be sunk by gunfire from HMS Derwent north of Bizerte. 8.50 p.m.: MV Empire Hope suffers 18 near misses before a bomb bursts a stove in its side, stopping the engines. In seconds, ammunition fuel and aviation spirit explode, setting the stern of the vessel ablaze. The crew abandon ship and are picked up by HMS Penn, the latter firing a torpedo into the doomed merchant ship to sink. 9.20 p.m.: Two Junkers Ju88s attack Deucalion. One bomb strikes the ship, a tremendous fire breaks out and the aviation spirit and kerosene explode. Captain Brown orders abandon ship and HMS Bramham approaches the merchantman to pick up survivors. 12.40 a.m.: The first torpedo attack by Italian MAS-boats and German Schnellboote in the narrows between Pantelleria and the Tunisian coast. MS 22 and MS 16 speed towards the passing cruiser HMS Manchester, loose their torpedoes and withdraw into the darkness. Seconds later Manchester is hit in the starboard side. Later, many of the survivors reach Tunisia and are taken prisoner by the Vichy French, who intern them in Bon Fichu, with the survivors from MV Glenorchy and MV Clan Ferguson. 2 a.m.: MV Glenorchy is hit by torpedoes from the Italian torpedo boat MS 31. Captain Leslie, mindful of the aviation spirit stowed all over the deck, orders his men to abandon ship. Some 124 souls, including the 25 passengers, survive the attack and are ordered to take the boats. MS 31 approaches the sinking ship and picks Chief Officer Hanney and eight men as prisoners. 3 a.m.: A second wave of Italian MAS-boats and German Schnellboote attack the convoy. MAS 552 and MAS 554 torpedo the Wairangi in its port side. Captain Gordon decides to scuttle the ship. The boats are lowered and later the ship is sunk. 3.30 a.m.: Schnellboote S30 and S36 torpedo the American Almeria Lykes and the ship is hit forward in No. 1 hold, where a stow of bags of flour absorbs much of the explosion. However, Captain Henderson orders the crew to abandon ship and 105 men board three boats. 4.15 a.m.: An Italian torpedo boat, MAS 564, closes in from the starboard side of the American ship Santa Elisa and fires a torpedo at point-blank range. The detonation takes place amid aviation spirit. The master orders the crew to abandon ship and the survivors are picked up by HMS Penn. 8 a.m.: Two Junkers Ju88s make a concentrated attack against Waimarama. Four bombs explode amid spirit and ammunition. A vast sheet of flame roars high up into the sky. The survivors are picked up by HMS Ledbury. 6.30 p.m.: Rochester Castle, Port Chalmers and Melbourne Star enter Grand Harbour. As the battle-scarred vessels slide between the arms of the breakwater, the Royal Malta Artillery band plays from the ramparts of Fort St Elmo to welcome the surviving ships. 6 a.m.: Brisbane Star, which was hit by a torpedo two days before, has been sailing independently, heading round Cape Bon and keeping inshore. Spitfires fly over the ship and remain flying over until it enters the harbour early in the afternoon. 9.55 a.m.: HMS Tartar sinks HMS Foresight with a torpedo and heads at high speed to Gibraltar. 11 a.m.: Captain Tucket of Dorset orders the crew to abandon ship and they board the boats. During the evening the ship is hit by bombs and sinks. 11.30 a.m.: A tremendous effort is made to tow the crippled tanker Ohio into harbour. Speed is worked up to a gratifying six knots, with a steady enough course. Morale rises accordingly and to cheer everyone up, Chattanooga Choo-Choo, is played loudly from HMS Penn’s PA system. 2 a.m.: With HMS Penn and HMS Bramham edging Ohio along the shore, HMS Ledbury lends its power to shove the tanker’s bow to make the turns off Delimara and Żonqor Points. Tears sting red-rimmed eyes as the Ohio proceeds towards Parlatorio Wharf in French Creek. Churchill recognised the sacrifices made to resupply Malta at all costs: “In the end five gallant merchant ships out of 14 got through with their precious cargoes. The loss of 350 officers and men and of so many of the finest ships in the merchant navy and in the fleet of the Royal Navy was grievous. As Operation Pedestal drew to a close, the unloading of the merchant ships, code-named Operation Ceres, also reached its final phase. The cargoes of Port Chalmers, Rochester Castle and Melbourne Star had been unloaded, and the discharge of Ohio and Brisbane Star was rapidly completed. For the authorities, the 568 Pedestal survivors remained a liability, and they were moved out of Malta as quickly as possible. Although 53,000 of the 85,000 tons of supplies loaded on the merchant ship finished on the bottom of the Mediterranean, the remaining 32,000 tons enabled Malta to stave off the target date for the island’s surrender, which was the first week of September 1942. Mr Debono is the curator of the National War Museum in Valletta, where relevant artefacts and information can be seen. A reminder that Low Mass is on Tuesday 15th August, at 7:30pm at Christ the King Church, Bedford MK42 0SP. All are welcome! Our Lady … died in private. It became Him who died for the world, to die in the world’s sight; it became the Great Sacrifice to be lifted up on high, as a light that could not be hid. But she, the lily of Eden, who had always dwelt out of the sight of man, fittingly did she die in the garden’s shade, and amid the sweet flowers in which she had lived. Her departure made no noise in the world. The Church went about her common duties, preaching, converting, suffering; there were persecutions, there was fleeing from place to place, there were martyrs, there were triumphs: at length the rumour spread abroad that the Mother of God was no longer upon earth. Pilgrims went to and fro; they sought for her relics, but they found them not; did she die at Ephesus? or did she die at Jerusalem? reports varied; but her tomb could not be pointed out, or if it was found, it was open; and instead of her pure and fragrant body, there was a growth of lilies from the earth which she had touched. The Gospel lesson, dearly-beloved, which has reached the inner hearing of our minds through our bodily ears, calls us to the understanding of a great mystery, to which we shall by the help of God’s grace the better attain, if we turn our attention to what is narrated just before. The Saviour of mankind, Jesus Christ, in founding that faith, which recalls the wicked to righteousness and the dead to life, used to instruct His disciples by admonitory teaching and by miraculous acts to the end that He, the Christ, might be believed to be at once the Only-begotten of God and the Son of Man. For the one without the other was of no avail to salvation, and it was equally dangerous to have believed the Lord Jesus Christ to be either only God without manhood, or only man without Godhead , since both had equally to be confessed, because just as true manhood existed in His Godhead, so true Godhead existed in His Manhood. To strengthen, therefore, their most wholesome knowledge of this belief, the Lord had asked His disciples, among the various opinions of others, what they themselves believed, or thought about Him: whereat the Apostle Peter, by the revelation of the most High Father passing beyond things corporeal and surmounting things human by the eyes of his mind, saw Him to be Son of the living God, and acknowledged the glory of the Godhead, because he looked not at the substance of His flesh and blood alone; and with this lofty faith Christ was so well pleased that he received the fullness of blessing, and was endued with the holy firmness of the inviolable Rock on which the Church should be built and conquer the gates of hell and the laws of death, so that, in loosing or binding the petitions of any whatsoever, only that should be ratified in heaven which had been settled by the judgment of Peter. But this exalted and highly-praised understanding, dearly-beloved, had also to be instructed on the mystery of Christ’s lower substance, lest the Apostle’s faith, being raised to the glory of confessing the Deity in Christ, should deem the reception of our weakness unworthy of the impassible God, and incongruous, and should believe the human nature to be so glorified in Him as to be incapable of suffering punishment, or being dissolved in death. And, therefore, when the Lord said that He must go to Jerusalem, and suffer many things from the elders and scribes and chief of the priests, and the third day rise again, the blessed Peter who, being illumined with light from above, was burning with the heat of his confession, rejected their mocking insults and the disgrace of the most cruel death, with, as he thought, a loyal and outspoken contempt, but was checked by a kindly rebuke from Jesus and animated with the desire to share His suffering. For the Saviour’s exhortation that followed, instilled and taught this, that they who wished to follow Him should deny themselves, and count the loss of temporal things as light in the hope of things eternal; because he alone could save his soul that did not fear to lose it for Christ. In order, therefore, that the Apostles might entertain this happy, constant courage with their whole heart, and have no tremblings about the harshness of taking up the cross, and that they might not be ashamed of the punishment of Christ, nor think what He endured disgraceful for themselves (for the bitterness of suffering was to be displayed without despite to His glorious power), Jesus took Peter and James and his brother John, and ascending a very high mountain with them apart, showed them the brightness of His glory; because, although they had recognised the majesty of God in Him, yet the power of His body, wherein His Deity was contained, they did not know. And, therefore, rightly and significantly, had He promised that certain of the disciples standing by should not taste death till they saw the Son of Man coming in His Kingdom , that is, in the kingly brilliance which, as specially belonging to the nature of His assumed Manhood, He wished to be conspicuous to these three men. For the unspeakable and unapproachable vision of the Godhead Itself which is reserved till eternal life for the pure in heart, they could in no wise look upon and see while still surrounded with mortal flesh. The Lord displays His glory, therefore, before chosen witnesses, and invests that bodily shape which He shared with others with such splendour, that His face was like the sun’s brightness and His garments equalled the whiteness of snow. And in this Transfiguration the foremost object was to remove the offense of the cross from the disciple’s heart, and to prevent their faith being disturbed by the humiliation of His voluntary Passion by revealing to them the excellence of His hidden dignity. But with no less foresight, the foundation was laid of the Holy Church’s hope, that the whole body of Christ might realize the character of the change which it would have to receive, and that the members might promise themselves a share in that honour which had already shone forth in their Head. About which the Lord had Himself said, when He spoke of the majesty of His coming, Then shall the righteous shine as the sun in their Father’s Kingdom Matthew 13:43, while the blessed Apostle Paul bears witness to the self-same thing, and says: for I reckon that the sufferings of this time are not worthy to be compared with the future glory which shall be revealed in us Romans 8:18: and again, for you are dead, and your life is hid with Christ in God. For when Christ our life shall appear, then shall you also appear with Him in glory Colossians 3:3 . But to confirm the Apostles and assist them to all knowledge, still further instruction was conveyed by that miracle. For Moses and Elias, that is the Law and the Prophets, appeared talking with the Lord; that in the presence of those five men might most truly be fulfilled what was said: In two or three witnesses stands every word Deuteronomy 19:15 . What more stable, what more steadfast than this word, in the proclamation of which the trumpet of the Old and of the New Testament joins, and the documentary evidence of the ancient witnesses combine with the teaching of the Gospel? For the pages of both covenants corroborate each other, and He Whom under the veil of mysteries the types that went before had promised, is displayed clearly and conspicuously by the splendour of the present glory. Because, as says the blessed John, the law was given through Moses: but grace and truth came through Jesus Christ John 1:17, in Whom is fulfilled both the promise of prophetic figures and the purpose of the legal ordinances: for He both teaches the truth of prophecy by His presence, and renders the commands possible through grace. And so while He was yet speaking, behold a bright cloud overshadowed them, and behold a voice out of the cloud, saying, This is My beloved Son, in whom I am well pleased; hear Him. The Father was indeed present in the Son, and in the Lord’s brightness, which He had tempered to the disciples’ sight, the Father’s Essence was not separated from the Only-begotten: but, in order to emphasize the two-fold personality, as the effulgence of the Son’s body displayed the Son to their sight, so the Father’s voice from out the cloud announced the Father to their hearing. And when this voice was heard, the disciples fell upon their faces, and were sore afraid, trembling at the majesty, not only of the Father, but also of the Son: for they now had a deeper insight into the undivided Deity of Both: and in their fear they did not separate the One from the Other, because they doubted not in their faith. That was a wide and manifold testimony, therefore, and contained a fuller meaning than struck the ear. For when the Father said, This is My beloved Son, in Whom, etc., was it not clearly meant, This is My Son, Whose it is to be eternally from Me and with Me? Because the Begetter is not anterior to the Begotten, nor the Begotten posterior to the Begetter. This is My Son, Who is separated from Me, neither by Godhead, nor by power, nor by eternity. This is My Son, not adopted, but true-born, not created from another source, but begotten of Me: nor yet made like Me from another nature, but born equal to Me of My nature. This is My Son, through Whom all things were made, and without Whom was nothing made because all things that I do He does in like manner: and whatever I perform, He performs with Me inseparably and without difference: for the Son is in the Father and the Father in the Son , and Our Unity is never divided: and though I am One Who begot, and He the Other Whom I begot, yet is it wrong for you to think anything of Him which is not possible of Me. This is My Son, Who sought not by grasping, and seized not in greediness , that equality with Me which He has, but remaining in the form of My glory, that He might carry out Our common plan for the restoration of mankind, He lowered the unchangeable Godhead even to the form of a slave. These things, dearly-beloved, were said not for their profit only, who heard them with their own ears, but in these three Apostles the whole Church has learned all that their eyes saw and their ears heard. Let all men’s faith then be established, according to the preaching of the most holy Gospel, and let no one be ashamed of Christ’s cross, through which the world was redeemed. And let not any one fear to suffer for righteousness’ sake, or doubt of the fulfilment of the promises, for this reason, that through toil we pass to rest and through death to life; since all the weakness of our humility was assumed by Him, in Whom, if we abide in the acknowledgment and love of Him, we conquer as He conquered, and receive what he promised, because, whether to the performance of His commands or to the endurance of adversities, the Father’s fore-announcing voice should always be sounding in our ears, saying, This is My beloved Son, in Whom I am well pleased; hear Him: Who lives and reigns, with the Father and the Holy Ghost, for ever and ever. Amen.